Let Monflo to become your business tool that will make most of the job done for you, wherever you are. Unique Connect Anywhere business feature will make sure that you will stay connected and have full access to your PC computers from any place on Earth. Monflo remote access software won’t let you down in any conditions. There are no situations that Monflo can’t overcome – double NATs and firewalls are not a problem anymore. Connect Anywhere feature guarantees the best connection quality and accessibility from any place you can imagine, as long as you have access to a stable Internet connection. Monflo is a software that you can rely on. Standard, phone-only, technical support in many cases is not enough to find a solution for many of the technical problems with software and system administration. Most often user do not have the knowledge needed to describe what the problem is or simply it is just impossible. Thanks to Monflo, user won’t have to do anything more than simply reporting that “something just happened”. Customer support rep will do all the thinking and work by remotely accessing user desktop and fixing the problem. Build and increase the sense of security of company’s customers by flawless support with Monflo. Monflo has also its business functionality in accessing files and data stored on your personal computer. Access presentations and documents from your office PC, show your clients how versatile your company is! The documents that have been prepared during your absence in office and are stored on Monflo Server computer can be easily accessed by you from your mobile device wherever you are and whenever you need to see them. There are many situations, that can make getting to work impossible, like getting sick, everyone sometimes get sick, it is normal. But your work needs to be done anyway, regardless of any circumstances. 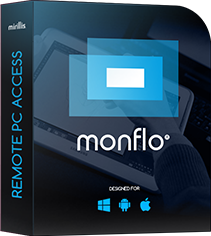 With Monflo it is not a problem anymore – all you need is to install it on both of your computers, setup the application, and it’s done. Work anytime you want, anywhere. Monflo gives you an unique opportunity to create your own fully private and secure infrastructure. By having your own remote server you can be sure of 100% data ownership - Monflo stays on your infrastructure and tracks data inside your own network. In this way, all data is collected, stored, and analyzed in one place, without a need to send to any third parties or public network. So, your data always stays yours. Monflo is a perfect business tool. With one time payment you can get a lifetime license for the ultimate software for client support and more! Remote desktop access to your PC is always available to you from wherever you are, whenever you need to access it. Access your Windows PC wherever you are at any time. Even double NAT will not be a problem! Use your mobile Android device in the same way you are using your Windows PC.